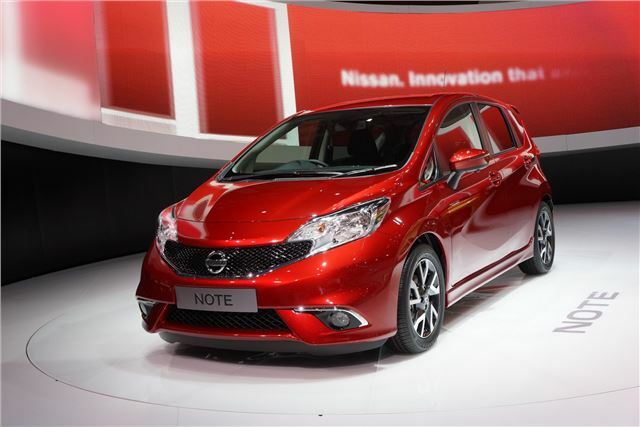 Nissan showed its new British-built Note at Geneva. The new car will go on sale in Autumn 2013, and although prices are to be announced, expect entry models come in at around £10,000. It’s much less conservative than the last generation car, with sharper angles and a sleeker, less upright profile. It might look more purposeful, but performance isn’t the name of the game – there’s a 1.2-litre petrol engine and a 1.5-litre diesel, which offers emissions of 95g/km. The 1.2-litre three-cylinder engine is offered in two forms – 80PS and 92PS. The more powerful version is fitted with a supercharger. It’s more frugal than the 80PS engine, with emissions of 99g/km and combined cycle economy of 65.7mpg. It’s offered with an optional CVT automatic transmission, but that pushes up emissions and reduces economy. The latest generation is set to feature all of the latest safety equipment, including blind-spot warning, lane-departure warning and a moving object detection system. Parking aids include a rear view camera that features an ‘overhead’ display to distance from objects in front and behind, as well as how the car is from the kerb. The range of trim levels is familiar from the rest of Nissan’s models – there are Visia, Acenta and Tekna versions, and even entry level models get cruise control and start/stop. Mid- level Acenta models get Bluetooth and air conditioning, while top-spec Tekna models get all the safety technology, along with part leather trim and keyless entry and start.